Charles Francis Jenkins and Thomas Armat together invented one of the most effective motion picture projectors of their day, and gave commercial public film screenings in September 1895. 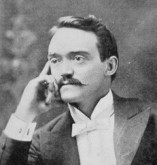 Jenkins was raised on a farm near Richmond, Indiana and by 1890 the amateur inventor was working as a civil service stenographer in Washington D.C. His motion picture experiments had possibly started as early as 1891, and from 1893, funded by one James P. Freeman, he employed an engineer to work on apparatus for '... the recording and reproduction of action'. A patent for his first ‘Phantoscope’ (sometimes spelled Phantascope, a name used for most of his motion picture devices, confusing later researchers including his biographer), was applied for on 24 November 1894 (published 26 March 1895, No. 536,569). Instead of a shutter, this used moving light bulbs synchronised with continuously moving film. This peepshow (not a projector) housed a shorter film loop than Edison’s Kinetoscope, but would have been cheaper and easier to build. A striking feature is film perforations apparently identical to those of the Lumière Cinématographe, the design of which was not then public. The peepshow machine was demonstrated at the Pure Food Exposition, Washington in November 1894.Jenkins filed a patent application for a ‘Kinetographic Camera’ camera/projector on 12 December 1894 (published 26 May 1896, No. 560,800). The design used multiple rotating lenses synched to continuously moving film with a suggested format of 3 inches wide. Images from the sequence Man Putting the Shot (published in The Photographic Times, 6 July 1894) were probably taken with such an experimental camera. With unperforated film, the machine would have been problematic as a projection device. In October 1894 Jenkins had met Thomas Armat at the Bliss School of Electricity, and on 25 March 1895 they made a formal agreement to work together. That year Jenkins quit his job to pursue inventing full time. Armat wanted to use Jenkins's cameras to supply films for his projection experiments; Jenkins wanted Armat to fund the projection developments. Soon abandoning projection experiments with continuously-moving film and multiple lenses, they tried a mutilated gear mechanism. On 28 August 1895 Jenkins and Armat applied for a joint patent covering this design (published 20 July 1897, No. 586,953) but a test machine was quickly damaged by the stresses involved. Armat sketched out an idea for a piston arrangement to move the film, spurring Jenkins to revive an arrangement that he claimed to had tinkered with previously – the eccentric gear, or 'beater' movement, (similar to that patented in France in 1893 by Georges Demenÿ). The beater-movement projector proved technically feasible though temperamental, and in late September 1895 the partners projected Edison Kinetoscope films at the Cotton States Exposition, Atlanta, in two small screening rooms with a common projection booth. Visitors wandering into the viewing rooms were asked for 25c on leaving. Jenkins ‘borrowed’ one of their three Phantoscopes and departed in mid-October to give a projection demonstration at his birthplace, Richmond, and did not return. He filed a patent as sole inventor but this was ruled to be 'in interference' with the joint patent taken out previously; the case was eventually decided in favour of the joint application. On 18 December 1895 Jenkins demonstrated 'his' projector to a distinguished audience at the Franklin Institute, Philadelphia, and was awarded a medal for progress in the field. After protestations by Thomas Armat most of the developments were recognised as joint efforts. 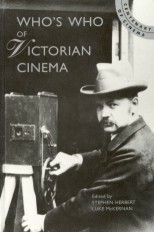 Embittered by the dispute, Jenkins later falsely claimed that successful film projection had taken place at Richmond on 6 June 1894 – more than a year before his documented screening in that town. In the Spring of '96, while Armat negotiated with Raff & Gammon for Edison to exploit their projector, Jenkins formed a short-lived agreement with the Columbia Phonograph Company, but eventually sold out the Phantoscope rights to Armat; although he continued to exhibit with a version of his machine, claiming its superiority over the Vitascope. In late 1896 Jenkins helped develop Siegmund Lubin’s Cineograph projector, which went on sale in January 1897. In December 1896 Jenkins applied for a patent for a film-printing machine to create projection prints from motion picture negatives. Retaining an interest in peepshows, in 1898 the inventor applied for a ‘stereoscopic mutoscope’ patent, but no commercial exploitation is known. Jenkins returned to his rotating multi-lens devices to market cameras for high-speed slow-motion cinematography, a camera design for eliminating static electricity (which could fog the film) and home movie peepshows. He went on to found the Society of Motion Picture Engineers (now SMPTE). As early as 1894 Jenkins had suggested a primitive television system. In 1925 – neck-and-neck with British pioneer John Logie Baird – he publicly demonstrated a mechanical television system with sound and ‘shadowgraph’ pictures. By the late 1920s the prolific workaholic had become a prominent figure in American television development, with novel transmission equipment involving prismatic glass scanning discs. Backed by the De Forest Radio Company, he operated experimental television stations in Washington D.C. and New York City, and by 1931 was selling receivers for the home. C. Francis Jenkins held around 300 patents in such diverse areas as paper milk bottles, automobiles, and radio aerials for aeroplanes. Jenkins was inducted into the National Inventors Hall of Fame in 2011.